Diamond fret files are the best way to crown your frets! Unlike traditional fret files, diamond files cut in both directions, they don't chatter, and the fret is smoother after crowning. These files are being used by repair shops and major manufacturers all around the world. Long-lasting diamond coating: Each file edge is electro-coated with micro industrial diamonds. These super-tough abrasive surfaces round the frets more smoothly and stay sharp longer than standard toothed files. Better control, faster work: Diamond particles cut on both the push and pull stroke (traditional files only cut one way). This gives better control over your work, and the job goes much faster. 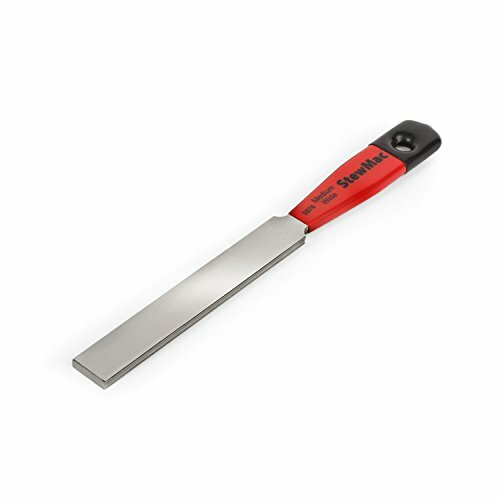 Each file has hollow-ground cutters in two sizes for crowning a variety of fretwire. This Medium + Wide file is for crowing guitar and bass fretwire. Works on stainless frets, too! All of our tools are suitable for use on stainless-steel fretwire, with the exception of our Fret Tang Nippers. Modern stainless-steel fretwire is known to be harder than the traditional nickel-silver blends, but our own shop experience indicates the wire does not cause premature wear of files or sandpapers. Made of tool steel, this file has a comfortable rubber-coated handle; the file cutting edge is 4" and overall file size is 7-3/8" x 5/8"